LONDON--(BUSINESS WIRE)--The global electric vehicle range extender market is expected to post a CAGR of over 11% during the period 2018-2022, according to the latest market research report by Technavio. A key factor driving the growth of the market is the increasing demand for plug-in hybrid electric vehicles. Hybrid vehicles are vehicles that are powered by more than one source of energy. The plug-in hybrid electric vehicle uses a rechargeable battery as the primary source of energy and has an additional charging unit known as range extender that is powered using an internal combustion engine fueled by gasoline. These types of range extenders can rectify the performance issues associated with low energy retention capacity of batteries used in electric vehicles. Also, the range extenders enhance the efficiency of a PHEV by extending the vehicles driving range when the battery is depleted and requires recharging. This market research report on the global electric vehicle range extender market 2018-2022 also provides an analysis of the most important trends expected to impact the market outlook during the forecast period. Technavio classifies an emerging trend as a major factor that has the potential to significantly impact the market and contribute to its growth or decline. The widespread adoption of electric cars has encouraged manufacturers to focus on other electric vehicles such as electric vans and busses. However, the effective traveling range is a major impediment to the growth of electric vans during the forecast period. The manufacturers of electric vans are employing various methods for reducing the power consumption of the vehicle. The automotive makers are focusing on lightweight body chassis, better aerodynamics, use of energy-efficient light emitting diodes for interior and exterior lights, and use of various battery management technologies to effectively divert power to essential systems and reduce wastage. “The vehicles manufacturers are also using technologies such as regenerative braking to recover portions of energy during operations and extend effective traveling range. Also, the vehicle manufacturers are planning to integrate telematics in electric vehicles, which will help in analyzing critical information such as electric battery health, an approximate number of miles that can be traveled using the existing power, navigation to the nearest charging system, real-time location tracking of the vehicle, and insurance-based services. These technologies are expected to be implemented during the forecast period,” says a senior analyst at Technavio for research on automotive components. This market research report segments the global electric vehicle range extender market by end-user (PC and CV) and geographical regions (APAC, EMEA, and the Americas). The PC segment held the largest market share in 2017, accounting for nearly 95% of the market. This end-user segment is expected to dominate the global market throughout the forecast period. APAC led the market in 2017 with a market share of nearly 64%. This region is expected to dominate the market through 2022, with an increase in its market share by nearly 3%. 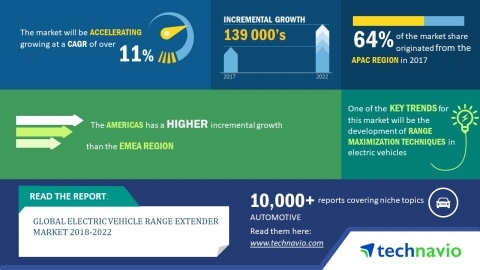 The global electric vehicle range extender market is expected to post a CAGR of over 11% during the period 2018-2022, according to Technavio.